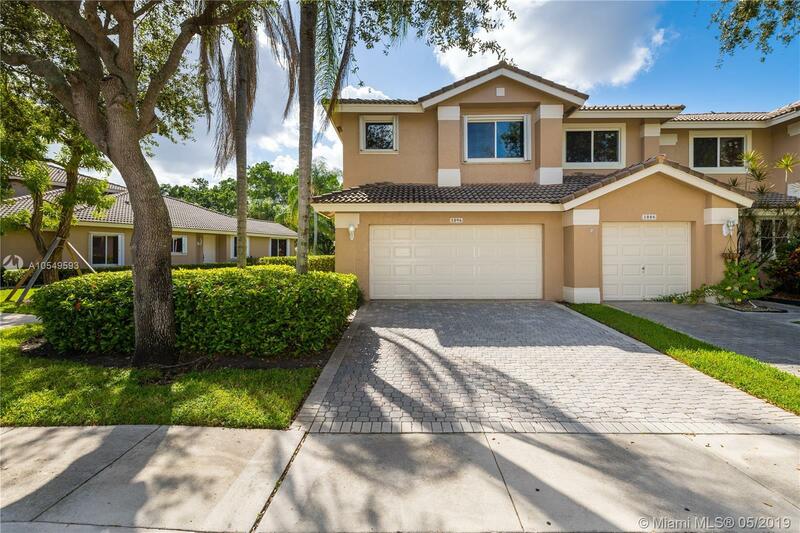 1096 SW 158th Way, Pembroke Pines, FL.| MLS# A10549593 | Susan J Penn l Best Agent l Buy & Sell South Florida Homes! Welcome to the LARGEST model in the Courtyards of Grand Palms. This beautiful townhouse is located on a desirable CORNER, GOLF COURSE lot and is move-in ready. Living space includes a wide-open, high-ceiling living-dining area with a separate family room and pass through kitchen. Features include a gorgeous wood & wrought iron stairway, upgraded guest bath, beautiful chandeliers, custom blinds, interior Washer & Dryer closet, screened-in patio, ACCORDION Shutter protection, and a 2-car garage. This unit is conveniently located across from additional guest parking and is short walk to the community pool. Grand Palms is a guard-gated, GOLF community that is conveniently located near I-75, parks, schools, restaurants, and shopping. Directions: Pines Blvd West Of I-75 To Grand Palms Drive South. Continue After Guard Gate To Royal Palm Drive To The Courtyards Entrance On The Left. Make Right On SW 10th Street And Follow Around To 158th Way To Home On The Right.